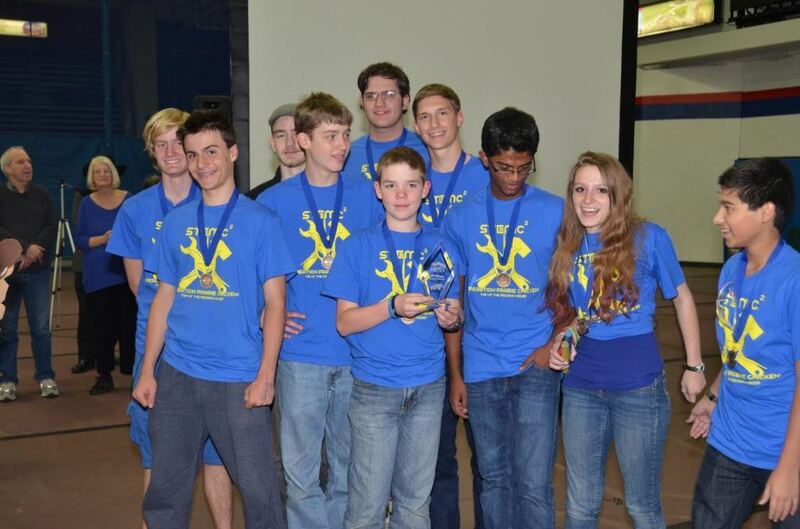 November 4, 2014 – The STEM School and Academy BEST robotics team won its fourth consecutive BEST award at the Rocky Mountain BEST hub competition. The team finished third in the robot portion. The BEST competition is made up of the head-to head-robot competition, but features many non-robotic challenges like an exhibit, marketing presentation, and engineering notebook. The team is coached by Joel Kirkland and led by Program Manager Dakotah Mann, Engineering Director Robert Belter, Manufacturing Director Licia Lamb, and Marketing Director Zach Coffee. Team members are both STEM high students and students from other programs. Each team that participates in the Rocky Mountain BEST competition is provided with identical kits containing all the materials and equipment necessary to build a robot. Approximately 6 weeks before the competition, teams are given the game rules for that year’s competition and it’s up to the team to design and build a robot to meet the specifications. The goals of the game this year were to transport parts for a wind farm, and assemble two wind turbines. The team devised a very strong robot and their Exhibit was considered to be 1st Class by one of the judges. The team is now engaged in preparing for the regional competition December 5-6, 2014 in Ft. Smith, Arkansas. * These teams qualified for the Regional Championship which will take place in Ft. Smith, Arkansas on December 5 & 6, 2014!